A few more from my recentish trip to Portland (early November, recent in geological terms). 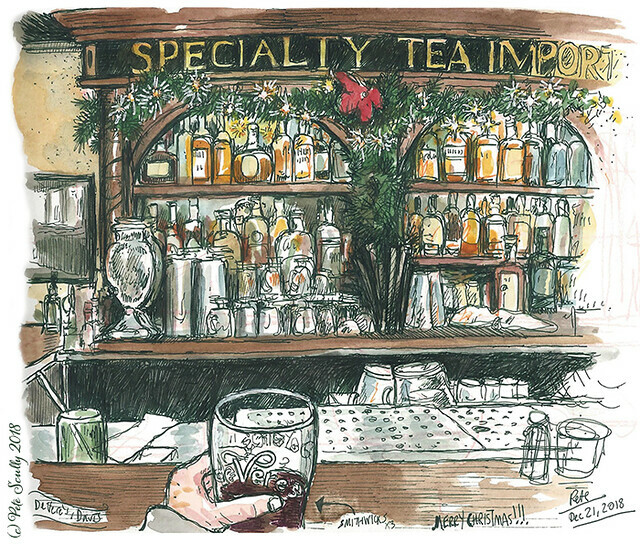 Above, I joined my friend Rita Sabler for her husband Jim’s birthday celebration at a cool little place in on Beach Street Portland I had never been to before, which involved some sketching and a lot of interesting conversation. Rita had invited me up to teach a workshop in Portland which was really fun, but it was really nice and relaxing to meet up with some of her friends. I last saw Rita in Porto in the summer at the symposium, she is actually a former UC Davis student (from before even I came to Davis). 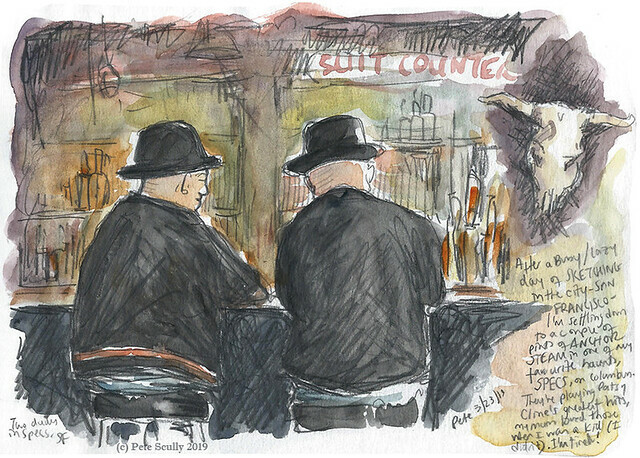 Check out Rita’s sketching work at www.portlandsketcher.com, she has done some great things lately (including a residency at the leper colony on Molokai!). On my second night there I met up another old sketching buddy and fellow pirate-sketcher, Kalina Wilson. 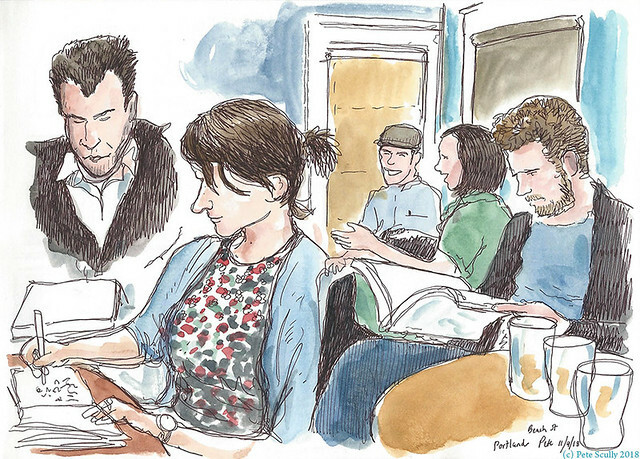 I really wanted to go back to this Belgian place that we had sketched one rainy Sunday afternoon back in 2012, Bazi Bierbrasserie, so we arranged to meet there. Except it’s not called that any more, it’s now to my surprise The Thirsty Monk. Beer was still nice though, and the conversation fun, always good to catch up after quite a while, I think I last saw her either at Manchester symposium or when my wife and I visited Portland one November (I forget the year). 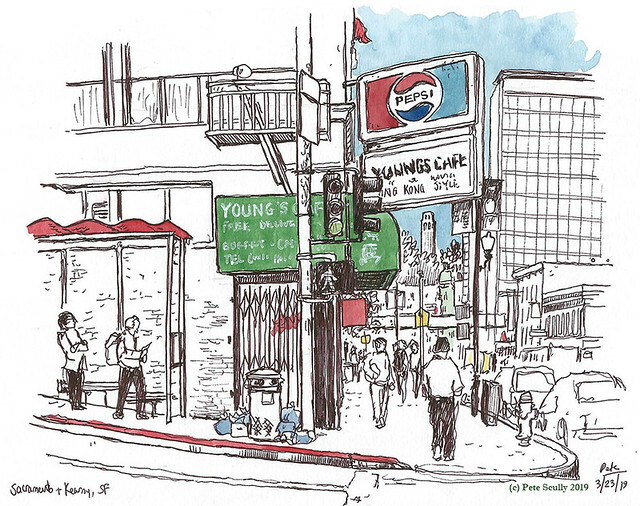 Check out Kalina’s sketching. 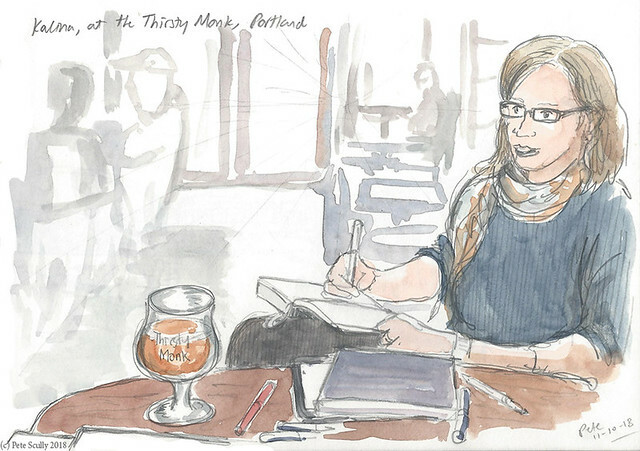 And above, a sketch I did at the hotel bar of the Doubletree in Portland. You have to go down to the bar to use their Wifi because it’s not included in the rooms (booo, join the 21st century Doubletree). I usually stay at this hotel because it is easy enough for the places I usually want to go, it’s right by the MAX line to the airport, but I don’t know, time to find somewhere else maybe. There was a heavy metal weekend going on at the hotel while I was staying there, so there were lots of long-haired metally people, dressed pretty much the same way (“metal”), which didn’t really fit in with the bland corporateness of the Doubletree. I always kinda laugh at the sameyness of metal outfits and rock dress, but of course when I was younger this was very much the scene in London that I enjoyed being around the most, the Hellfire Club on Oxford Street, the Intrepid Fox on Wardour Street, the Marquee on a Thursday night, I loved those places. And I would dress, well actually I would wear a bright green football shirt and have short hair because I liked to be different to everyone else, but I could mosh with the best of them. Those were the days. I felt quite at home around all the rockers, even in the sanitized corporate setting (and Doubletree, don’t put the toilets so far from the bar, yeah?). 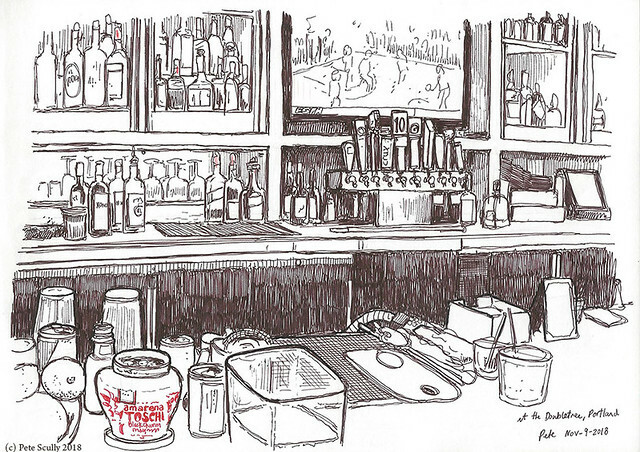 Anyway I sketched the bar, in its bland corporate light wood and screen showing basketball. Not exactly Old Town Pizza (now that is an interesting bar to sketch!) but a good way to get sleepy before bed. After I got back from Portugal, I had a hectic week (few weeks really) trying to settle back in. Busy work, busy life, jet lag, waking up at 3am every day, and the insatiable urge to just KEEP ON SKETCHING. It’s hard to explain the urge to draw stuff all the time. It’s probably less hard to explain coming back from a place like Porto where everything is a sketch waiting to happen, to Davis, which as we have seen over the past decade or so is worthy of a few sketches itself, but Porto it ain’t. You can only beat the team you’re playing, as they say, and since coming back I have ramped up my sketching of Davis once more after a relatively uninspired and fallow period. I’ve sketched almost everything I’ve wanted to sketch, so it comes down to sketching some of the old favourites just to keep the pen working, so one evening I popped once more to my local pub De Vere’s, always a nice place to hang out, and flexed the old ink muscles. 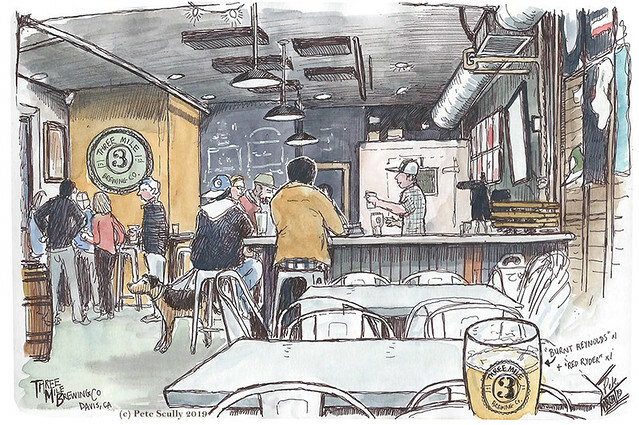 This sort of drawing is about observing lots of detail, tackling interior perspective, and having a nice cold beer while you’re at it (the weather was so hot this summer). 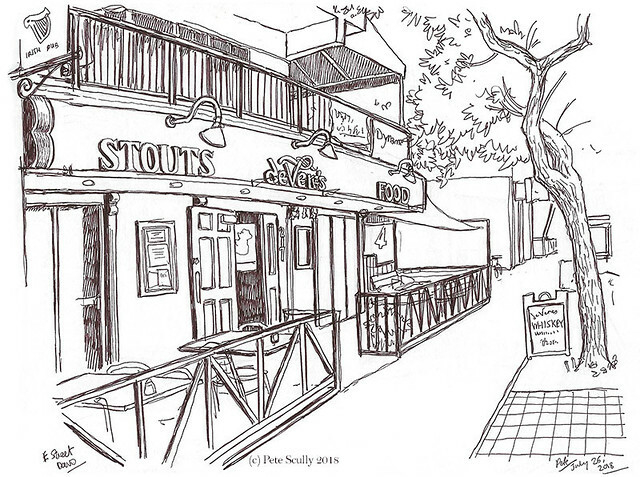 What’s more, I drew the pub from the outside a few days before: see below. 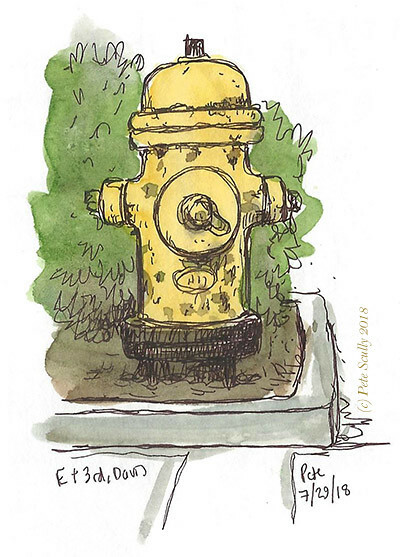 And as you can see, I also drew a Davis fire hydrant. These finished off my Seawhite sketchbook so that it was completed in July. 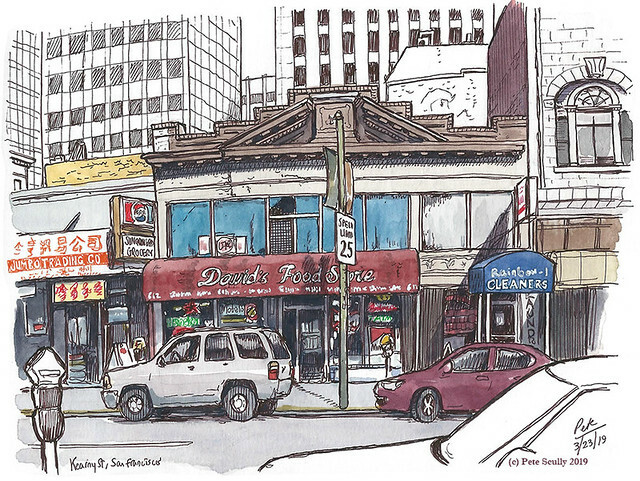 Now, I have a few more London sketches (and accompanying stories) to post, and then a bunch of new Davis panoramas I’ve been doing, but in the meantime I think I’m going to go out on this fine Saturday and do some more. I also need to get on setting the dates for the next few Let’s Draw Davis sketchcrawls so stay tuned for those. 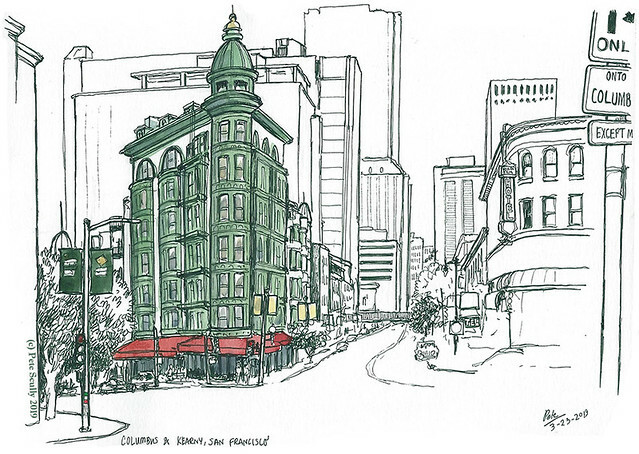 My recent sketching travels has filled me with a new sketching-energy I want to share.